This week’s Single of the Week is by a legend. I first remember him in 1970 shouting out “Oakworth” in the classic film The Railway Children where he played Albert Perks the station porter but little did I know then that eight or nine years previous he’d been a pop star. Younger readers will probably only know him from his role as Wilfred Mott – Doctor Who’s sidekick in the 2007 Christmas special Voyage of the Damned. Unless you’re an avid fan, you may not know that Bernard appeared as Doctor Who’s companion, Tom Campbell in Daleks – Invasion Earth: 2150 A.D. in 1966. Before all, that he in the UK singles alongside Nat ‘King’ Cole, Ray Charles, Elvis Presley, Helen Shapiro and Brenda Lee in 1962. Bernard was born in Oldham, Lancashire in 1928 (he will be 90 at the end of this year) and his career began in 1956 at the Arts Theatre in London where he played the (twin brothers) two Dromio’s in Shakespeare’s A Comedy of Errors. 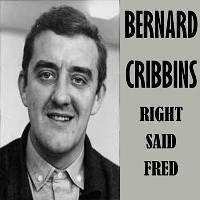 Soon after he appeared in another show which got his singing career started, in an interview with Jon Dennis at The Guardian, Bernard recalled, “The origins of my recording career go back to a revue show in 1961 or 62, something like that, called And Another Thing. We had a very nice cast of young up-and-comings, like Joyce and Lionel Blair, and some very good writers, including Barry Cryer – he wrote some of the sketches. I had two numbers in it, and one was called Folksong. George Martin, who was then head of A&R at Parlophone, and had made records with Charlie Drake and Peter Sellers, came to see the show with a view to recording it.” George then signed Bernard to the Parlophone record label. The vision of the song is so clear, Charlie has an idea that the only way to get the piano in was to remove the ceiling and lower it in with a rope, but being a bit heavy-handed with the crowbar it became like a Laurel and Hardy sketch and the ceiling caved it and Charlie ended up with ‘half a ton of rubble’ on his bald head. It’s got that ‘typical’ workman attitude, if it doesn’t come easy, stop and have a cup of tea. Bernard’s third and final hit, Gossip Calypso was written by the actor Trevor Peacock, who is best remembered for his roles in The Vicar of Dibley, Eastenders, My Family and Between the Lines which stalled at number 25. Bernard, however also recorded an album which contained I’ve Grown Accustomed to Her Face and a faithful version of When I’m 64. The only other hit that Ted Dicks and Miles Rudge wrote was the novelty song A Windmill in Old Amsterdam, a hit for Ronnie Hilton in 1965. It seems a lot of songs they wrote were regular favourites on Junior Choice which would have kept the royalties rolling in. They also wrote the theme to Carry on Screaming in 1966 and the following year worked material for Kenneth Williams for his album On Pleasure Bent. A Windmill in Old Amsterdam won an Ivor Novello Award for the Year’s Outstanding Novelty Composition. Rudge died in October 2007 aged 81 and Dicks, who also composed the theme to the television programme Catweazle, died in January 2012 aged 83. For another generation, Bernard will always be remember as the narrator of The Wombles and a story teller on Jackanory which was a 15-minute children’s TV series that ran from 1965 until March 1996. It featured many celebrities reading stories, a huge list which includes Clement Freud, Sheila Hancock, Penelope Keith, Tom Baker, Richard Briers, Angus Deaton, Judi Dench, Lenny Henry, John Hurt, Jeremy Irons, Arthur Lowe Spike Milligan, Willie Rushton, Kenneth Williams, Victoria Wood and a whole heap more, but it’s Bernard who holds the record for the most appearances, 111 in total. In 2011 he was awarded an OBE in the Queen’s Birthday Honours List for his services to drama and three years later he received the J.M. Barrie award for his lasting contribution to children’s arts. Bernard is still popping up in various television shows and live appearances, I remember seeing him in May 2015 when he gave a reading at VE Day 70: A Party to Remember in Horse Guards Parade. On a BBC London show in 2016 listeners were asked to ring in with their favourite comedy tracks and Right Said Fred was voted the favourite. “It’s become a little classic. It’s a real joy,” said Bernard “Long-range applause, I call it.” Anyway, time for another cup of tea after all, Charlie and Fred had six of them in two minutes and 16 seconds.